I watched a TEDx Talk by Chris Lehmann named, “Education is Broken.” Chris Lehmann starts off by saying that “high school stinks.” He claims that it stinks because students are told what to do over and over again. Basically, the kids are just bossed around all day. Then, they don’t know why they need to know any of the concepts they’re learning. The information is not relevant. Students do not know why classes are important. It’s a problem. Chris claims that unfortunately, schools are designed as factories where students are “on a conveyer belt moving from class to class.” Schools were built in a time when information was scarce and you had to go to school to get the information from the teachers. Now, we live in a world of information overload and you can get information on any topic on the Internet in less than a second. 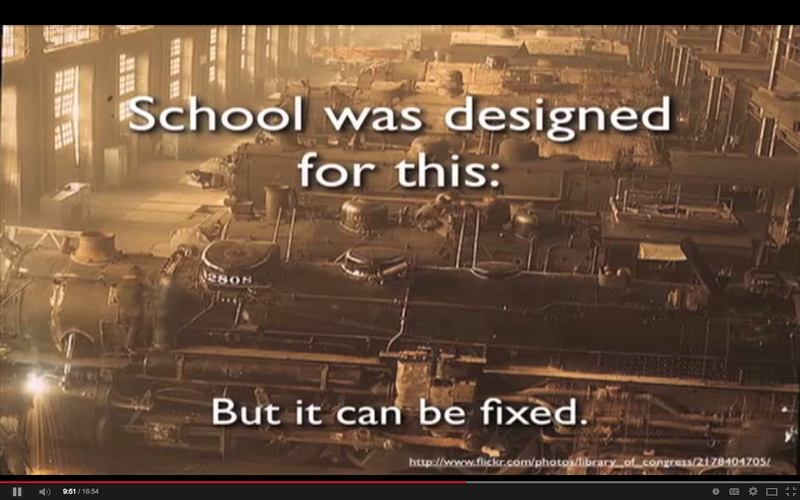 Schools are designed as factories with assembly lines. Chris says that school now need to “teach us how to learn.” School should open up students’ minds. School should not be pointless, but should teach students how to live. Projects and assignments should be given so that students can learn more about themselves, and the subject matter they are studying. But, Chris says that the main purpose of school should be teaching students how to be citizens. Then, they’ll become the workers, activists, friends, community members, husbands, wives, and parents that the world needs. School needs to be building confidence in students so that they can go out in the world after school and be those things. I’m all about changing the world. One of the biggest reasons I want to be a teacher is to inspire children to make a difference in the world. The ideas Chris Lehmann are the same ideas I keep hearing over and over again since I started graduate school in May. I agree with Chris’s ideas. I think his ideas could be harder to implement than it sounds. However, every teacher could make a few small changes in their classroom to make learning more relevant and citizenship more important to their students. Together, as millions of teachers, a education may not be as broken as it is now.